Like any technology the camera as we now it has changed many times during its life. It’s a process that continues of course, even with modern digital SLR cameras. For every feature, function and design point, there was a first time. Here we take a look our first 5 of those important milestone cameras; the ones that made history, and the ones that continue to have a lasting impact on camera design in the 21st century. SLR cameras had been around since the 1930s. They all worked on the same basic premise; you viewed the image through the lens via a mirror contained within the camera housing. When you fired the shutter the mirror gets out of the way. The shutter opens, and the film is exposed. Then the shutter closes to end the exposure. However, if you held a camera from the early 50s it would be very different from what you would be used to. It wouldn’t have an “eye level” viewfinder for instance. Instead you would have to hold the camera down at waist level and view the image through the mirror by looking downwards . The image you would see would often be “flipped” making composing your image hard, and trying to focus correctly would probably be a case of luck rather than judgment. Taking pictures with one of these was no easy feat! The Asahi Pentax (or “AP”) changed all of that. It introduced an eye level finder, which is now standard on all SLR cameras (and some other types too). This also meant the image wasn’t flipped, so seeing what you were going to get on your prints was much easier. The AP also returned the mirror once the image was taken, meaning it was easier to take multiple images quickly. On previous SLR cameras the mirror would stay “up” once you took the picture. You had to move it back into its correct position yourself! It was such a success that the camera brand Asahi changed its name to Pentax a short while afterwards, a name that endures to this day. Given the impact photography has had, and continues to have on society, and given the impact this camera had on the subsequent 60+ years of camera design, we don’t think it’s over stating it to say this is one of the most influential pieces of design and technology of the 20th century. If you can find one, buy it – the cost will be significant, but you will own a little piece of history, and have a camera that will be intuitive to use and superbly built. With some cameras you could purchase clip on meters, but they were recording all ambient light, and not the light that was getting to the film through the lens. They were not therefore particularly accurate, and they were often cumbersome to use. A few cameras came with built in meters, but again these were recording the amount of light at a completely different point to the lens, so not a great help. The Pentax Spotmatic changed all of that. It was the first SLR to hit the market where metering was done through the lens (or “TTL” as its often abbreviated to) and as an integral part of the camera, without the need for any add ons or separate purchases. All you had to do was peer through the viewfinder to compose your shot, and all the exposure information you needed was there in the viewfinder for you. The Spotmatic, like the AP before it, was an instant hit and other manufacturers were quick to follow suit. It remains a “cult classic” and it is one of the cameras that people starting out with film photography still look to as their entry point into the world of film. Like with all cameras of the time, and especially Pentax ones, the build quality is unrivalled. It’s no cliché to say they simply don’t make cameras like this anymore. 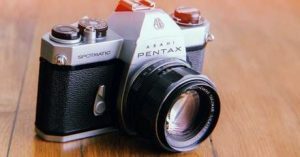 The Spotmatic was so successful that for a long time afterwards – the best part of ten years – Pentax didn’t bother making other cameras, they just kept making this one with the odd alteration every now and then! This is great, because it means there is a Spotmatic out there for every user, and every budget. I know what you’re thinking; are these all going to be Pentax cameras?! Well no, they’re not, but the fact the first 3 are all Pentax tells you just what a trailblazing brand they were, particularly back in the early days of SLR photography. In the 1960s, all SLR cameras were fully manual – the user was in charge of everything the camera did, or didn’t do. The Electro Spotmatic (or “ES” as its often badged) introduced Aperture Priority Mode. This enabled the user to simply decide what aperture they wanted to use, and the camera selected the shutter speed needed to get the right exposure. The revolutionary steps didn’t stop there though – this camera had the world’s first electronic, rather than mechanical, shutter. Now there’s much debate over which is better, but it was a first nonetheless! What it did mean was that the shutter could be “stepless”. Mechanical shutters had to work at fixed, and rather limited, speeds, typically 1/60th of a second, 1/125th, then 1/250th and so on. With the Electro Spotmatic, if you needed 1/185th of a second to get the right exposure, that’s what you would get! This made it so much easier to get correctly exposed photographs. So not one, but three revolutionary steps, all in one fantastically built camera. It really does have a claim to be one of the greatest SLR cameras of all time. If the thought of having a fully manual Spotmatic is a bit daunting, and you’d like to have aperture priority mode to fall back on, this could be the camera for you. It also comes in black as standard, whereas previous Spotmatics were made in chrome, with the black bodies being limited edition, and therefore rarer and more expensive today. So if black bodies float your boat, that’s an added plus too. In today’s ‘real money’ terms this camera cost around £1,000 on its release in 1971. Just shows what a bargain they are today for those looking to make a start on their journey into film. 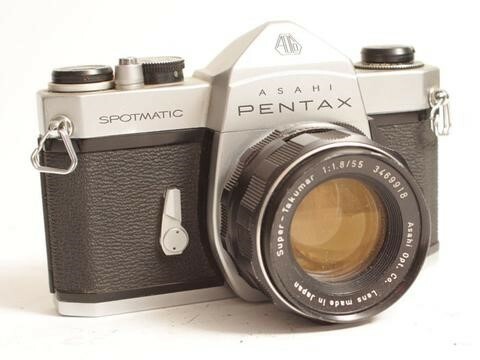 The Asahi Pentax was such a success back in the late 50s, that nobody bothered to question whether SLR cameras could be designed in an even better way. That is, until Olympus took a fresh look at things…. The main complaint about cameras before this one came along was their size. They couldn’t fit in even the biggest pocket, and you certainly didn’t want to be lugging one, or more, around your neck all day, not unless you fancied a trip to the chiropractor some time soon!! But, hey, that’s just how cameras have to be built, right? Olympus decided to challenge that. They went, quite literally, back to the drawing board, with the aim of seeing whether SLR cameras could be re-designed to make them more user friendly. 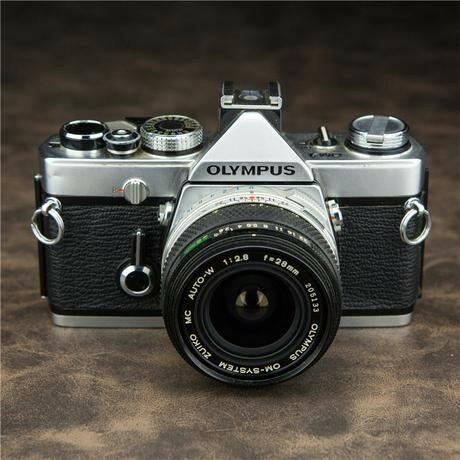 Their solution was the Olympus OM1, a camera as loved today as it was then, and a camera with a genuine claim to being one of the greatest 35mm SLR cameras of all time. The OM1 was, roughly, 65% of the size and weight of previous SLR cameras. This meant it could fit in a decent size pocket and that you could quite easily carry it around your neck. One of the main ways this space was saved was by moving the shutter speed dials from the top of the camera to around the lens mount. This had the added bonus of meaning you could change the shutter speed in a more intuitive way, and without having to move the camera away from your eye to help make the adjustment. Whilst they weren’t the first to try it – Nikon had done that in the 60s – it still seems a bit of a surprise to us that more manufacturers didn’t follow suit with the success of this design – we certainly love it! The Olympus lenses from the time also have a well-earned reputation as being some of the sharpest ever made, and they don’t break the bank either. Much like the Asahi Pentax had done nearly two decades before, the OM1 revolutionised SLR design in the 70s, with most brands rushing to compete with the OM1 by introducing smaller models during the 70s. Some great cameras in their own right – like the compact Pentax MX for instance – owe a debt to the OM1! With cameras getting smaller, lighter and generally more affordable, they were becoming more common in households throughout the world. Aperture Priority (or “Av”) options were become widely available and by the mid-70s there were far more cameras offering this as an option than there were manual only cameras. Pentax decided to take things a step further. In 1976 they realised the Pentax ME, which was the world’s first Aperture Priority only camera. You didn’t even have to set the camera Av mode, because there simply wasn’t a manual mode and Av was the mode! Obviously for the enthusiast this wasn’t going to be attractive, but for the beginner photographer it was fantastic. Just pick it up, set your aperture, and away you go. You all but guaranteed yourself a well exposed shot without having to touch any buttons on the camera. 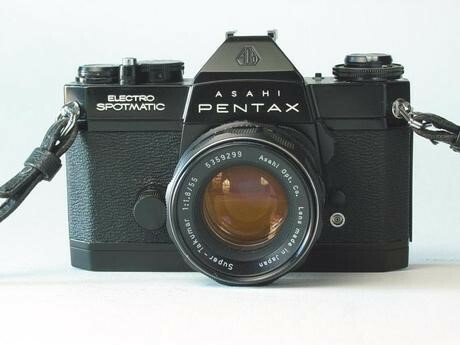 This stripped back design meant the camera could be more affordable too, at around half the price of a lot of other cameras from Pentax and other brands at the time. It was another example of cameras shrinking down to more manageable proportions as well – this was even smaller than the Olympus OM1. Within a year or so cameras from the other major brands were available on the market with Av only mode, but Pentax showed yet again that it was ahead of the curve by being first to market. The ME was hugely popular and went on to be the basis of the design for the subsequent (and even more fantastic!) ME Super, as well as other even cheaper and more basic Pentax models, like the MV and MG. In part 2 we’ll take a look at exciting developments in the late 70s and early 80s, as manufacturers looked to embrace technology to give users things like auto-focus, program mode and spot metering. 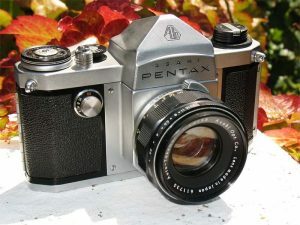 Nice overview of the first 35mm Pentax slr cameras. 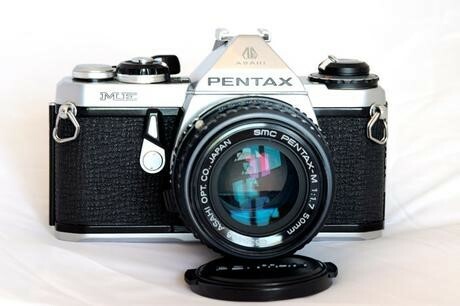 Implied in your opening comments is that Pentax introduced the first fixed pentaprism slr. This is not the case. VEB Pentacon had this feature on its early Contax slr’s available from 1952 to around 1956. So whilst VEB Pentacon beat Asahi to it, the Contax never enjoyed the market penetration of the Pentax, so one could say that it was the Pentax that lead the way to the future of slr design, and certainly with some genuine firsts along the way. As an added intrigue, it seems Asahi purchased the name Pentax from VEB Pentacon. Re-reading this article I should also have pointed out that the Spotmatic was not the first TTL metering 35mm camera, this honour goes to the Topcon RE Super.